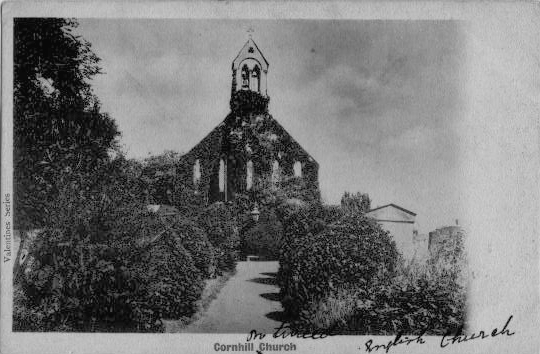 There has been a church in Cornhill since Saxon times. 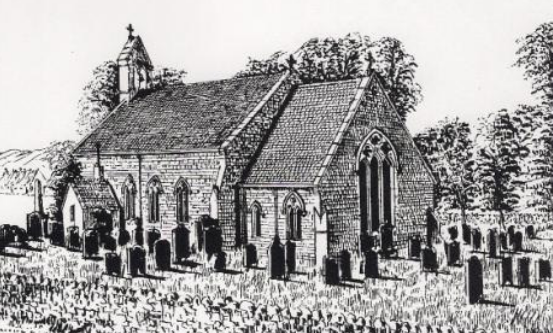 The old church was first established as a chapel of ease to Norham in c.1082. At that time, Norham became the property of Durham Cathedral. In 1750 the church was in such a poor state that it had to be rebuilt. The work was completed in 1752. At this time, the building was simply ‘composed of four walls, a few sash windows, and a street door, with a pinnacle over the west gable’. In 1840 further restoration work was carried out by the architect Ignatius Bonomi, when the church was rebuilt using some of the stone from the 1750 church, and the campanile bell tower was added. This work was financed by voluntary contributions from a number of societies and individuals. 58 sources of funding raised £524, 12 shillings and one penny. The cost of the work amounted to £524, 12 shillings and seven pence. Local legend has it that when the building was enlarged in 1840, the body of an 8ft man was found buried under the nave. By 1856, the church had an harmonium and the choir was created. The Rectory held a lending library of 300 volumes. The Chancel was added in 1866. 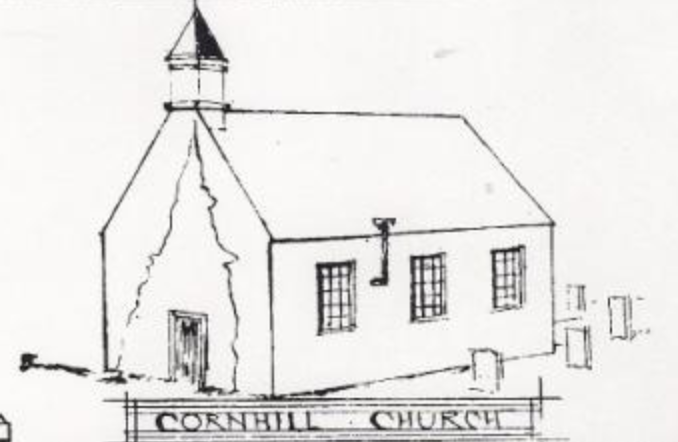 On 20 June, the Foundation Stone of a Chancel for Cornhill Church was laid by the Revd. S.A. Tyler, MA, the first Rector, in the presence of several parishioners and others. The chancel was first used on 23 December of the same year when the Venerable Archdeacon of Lindisfarne (Hamilton) preached from 1 Samuel 7 verse 12. About 20 additional seats were obtained by the addition of the chancel. The Countess of Home on this occasion presented to the Church a handsome new font. Beautiful kneeling cushions for the entire length of the communion rails, the north and south ends of the altar table and round the font were worked by 11 ladies of the congregation. 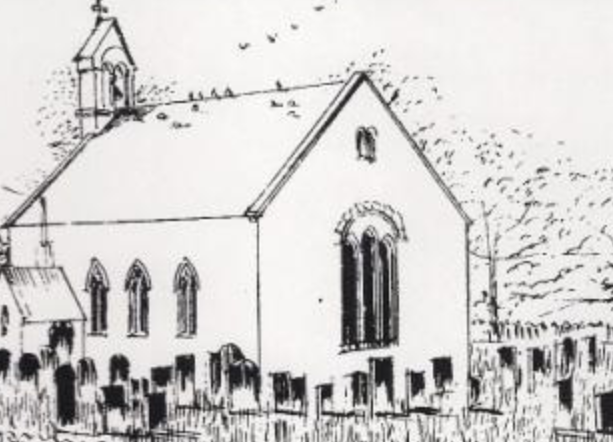 At this time, the church took on its current form, consisting of a nave, with a porch on the south side, a vestry/kitchen on the north side and the Chancel. At the west end of the nave is the bell turret. There is a gallery at the west end in the interior, which is reached by a stair at the foot of the bell turret. A memorial window to the late Mrs Dickins (nee Collingwood) of Cornhill House was put up on 5 February 1868, and another window was added afterwards by relatives and friends. The former cost £10, 12 shillings. The latter cost £22. Both were made by Mr Wailes of Newcastle. 34 subscribers gave £514, 12 shillings and one farthing to cover the cost of the new chancel. A lectern was added in 1870 for a total cost of about £7. All of these improvements were paid for by voluntary subscriptions. The Church was re-pewed with open seats during 1869 as well as re-floored, dry rot having seriously affected the joists underneath as well as the flooring. At the same time, the Harmonium was effectually repaired and tuned. The entire cost was £94, 17 shillings and ten pence. In 1870, a lectern was added to the contents. 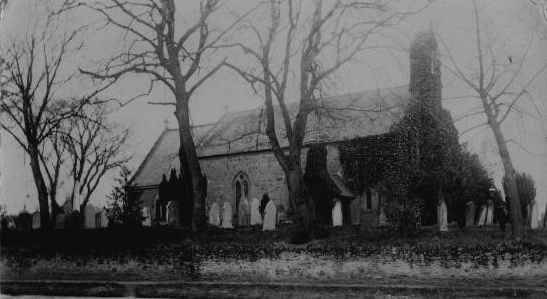 Photographs of the church in the 1900s:-. In 2018, a churchyard project was started to try to make the church and its surroundings more of a community space, attractive to both residents and visitors. The church is an important symbol, being an obvious and large Anglican building in the first village inside England on an important arterial road, the A697. During the 18th, 19th and early 20th centuries, it was the focal point for Anglican worship, with many Scots (including the Earls of Home) crossing the border to attend services. The Church is situated in the centre of Cornhill, on a raised plot between the Village Shop and Village Hall, surrounded by the graveyard, and bordered by roads. From the 12th to the 17th Century, the area was a semi-permanent war zone with every monarch from Henry I to Elizabeth I passing through Cornhill en route to or from Berwick and Wark, both of which had important castles which were vital to the defence of England. The Rev. Samuel Arnot Tyler (born 1803) is recorded as ‘Perpetual Curate of Coirnhill’ in the 1851 census, living at the Parsonage. The same is recorded as ‘Incumbent’ in the 1861 census. He is recorded as‘Rector of Cornhill’ in the 1871 census, living at the Rectory. At the time of the 1881 census the Rectory was unoccupied. The Rev. 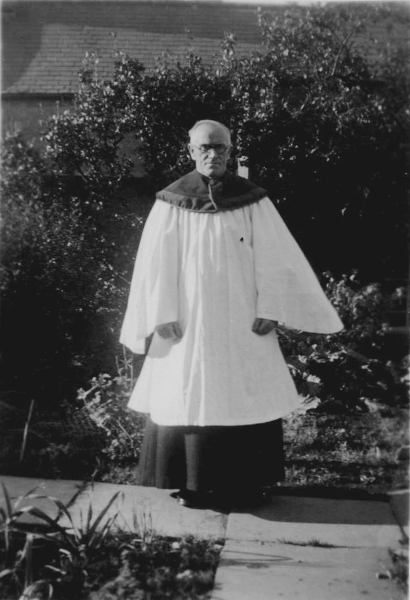 Canon William Lyall Holland was Rector in the 1891, 1901 and 1911 censuses, living at the Rectory. These are complete and may be found here (relocates to the Records page). St Helen (Helena) lived from about 249-329 A.D. It is believed that she came from Drepanum, in the Roman province of Bithynia, because her son, the Emperor Constantine, renamed Drepanum as Helenopolis after her. Other, more fanciful, claims assert that she was English (Geoffrey of Monmouth) or that she came from Trier, the capital of the northern Roman provinces. In about 312, aged over sixty, she became a Christian, and was so devout that contemporaries thought she had been so since childhood. She dressed quietly, gave generously to churches, to the poor and prisoners. She made a pilgrimage to the Holy Land, where she died. She was buried in Rome. Helen’s part in the discovery of the ‘True Cross’ is noted by St Ambrose (Aurelius Ambrosius), a 4th century bishop of Milan and one of the four original Doctors of the Church. This is also the subject of Cynewald's poem Elene (9th century). St Helen’s feast was kept in several southern English monasteries, but dedications to her,135 in all, are more frequent in the north-east, possibly because of Constantine’s connection with York. It is celebrated on 18th August. Helen is thought to have brought numerous Christian relics from Jerusalem, by far the most important of which was the reputed Titulus Crucis or name-board of Jesus, By Roman custom such a board was attached to the cross of a prisoner condemned to crucifixion, giving the name and crime. According to John 19:20 the inscription above Jesus was written to Pilate’s instruction in Hebrew (Aramaic), Latin and Greek (Koine) in that order. However, for political reasons, the actual order would almost certainly be Latin, the official language of the Empire, at the top, followed by Koine Greek, the language generally understood between the Roman and local administrations, and lowest, the Aramaic of the common people. The wording as quoted in John 19:19 in the Greek New Testament was Iesous ho Nazarenos ho Basileus tōn Ioudaiōn or Jesus the Nazarene the King of the Jews (note Nazarenos = of the Nazarene sect of the Jews, not Nazaraios = man of Nazareth). This translates in the Latin Vulgate bible as Iesus Nazarenus Rex Iudaeorum, giving the common acronym INRI seen in many depictions of the crucifixion. After the Jewish hierarchy objected to the wording, Pilate replied, ‘Ho ge'grapha ge'grapha’, ‘what I have written I have written’ (John 19:22). It is worth noting that Jesus had conducted his own defence before Pilate and it is highly likely that he did so in Koine Greek. There are two principal claimants to be the titulus found by Helen, both held in Rome. One has the languages in the order copied from John and there is a difference in the Latin wording. This item is likely to be a medieval creation, perhaps made for the Crusader souvenir market. The other, kept at the Basilica di Santa Croce in Gerusalemme, has been examined by experts in first-century inscriptions and found authentic and the lines are in the correct political order. However, radio-carbon dating places it at about 975 AD but it is thought to be an exact replica of the lost original.